A single layer membrane is designed to be easily installed on a commercial roof. 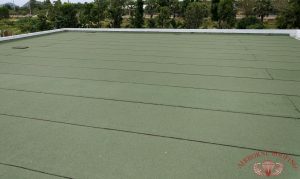 It has great flexibility, is resistant to UV radiation, and can be fastened or glued directly over the roof insulation. Need a Single-Ply Membrane Roof? Call (856) 662-1382 for Single-Ply Membrane Roofing services in Berlin and Cherry Hill, NJ. Thermosets: The most common type of thermoset single-ply roofing membranes are EPDM roofs, commonly referred to as “rubber roofs”. Thermoplastics: Easily conforms on the roof upon heat application, the most common type being TPO roofing. Thermoset membranes are ideal for large, flat roofs, since their manufacture size has minimal seams due to its size. The majority of thermoset single ply membrane roof, such as EPDM roofing, are recommended to be paired with a roof coating that increases UV protection and prevents damages from occurring within the structure. Thermoplastic single ply membrane roofs are excellent in chemical resistance..
A Properly Installed Single Ply Roof From Airborne Roofing After Installation And A Roof Coating. In some instances, a combination of attachment methods are used to secure a roof, especially for older building roofs that have undergone several repairs and replacements in the past. A single ply membrane roof has been the leading choice in commercial buildings due to its proven long-term performance, design flexibility, and the quality and speed of installation. Could your commercial roof benefit from a new roof service? Contact us (856) 662-1382 to learn more about single-ply membrane roofs in Berlin and Cherry Hill, NJ. We’ve been serving all of South New Jersey since 1968! Updated on September 21, 2018 at 2:44 pm by Airborne Roofing.